Members of the suborder Tylopoda (which includes llamas, camels and dromedaries) have only two functional toes on each foot. The members of the genus Camelus have on their backs humps of fatty tissues which contain stored food. 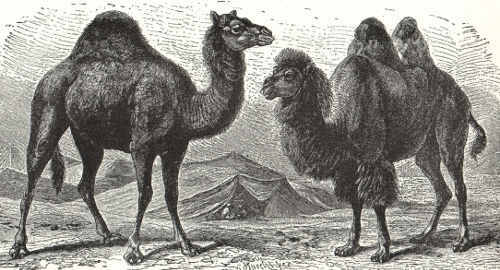 The Bactrian camel, Camelus bactrianus, has two humps. It is almost 2 meters high at the shoulders and is heavier and stronger than the dromedary. The Bactrian camel is found throughout Central Asia from China to Turkestan and, apart from a few wild herds in the Gobi Desert, is known in only a domesticated state. It is used for transport and also provides milk, meat, leather and hair for spinning and weaving. The dromedary, Camelus dromedarius, also known as the Arabian camel, has only one hump. It is well adapted to a desert environment, with broad feet for walking in sand and long eyelashes and nostrils that close for protection against dust. Like the Bactrian camel, the dromedary can feed on coarse desert plants and is able to survive for long periods without water, mainly through the variability of its body temperature. When the outside temperature rises, most mammals keep their body temperature stable by perspiration and thereby lose a lot of water. However, the camel’s body temperature may rise by 6 degrees Celsius before the animal begins to perspire without becoming feverish. When the heat of the day is greatest, camels sit facing the Sun and close to one another, thus exposing smaller areas of their bodies to the Sun’s heat. The mares separate from the main herd to give birth to a foal every second year. The gestation period is 12 to 13 months and, within 2 days of its being born, the foal is running with ease and keeping up with the herd as it moves on. Although they chew the cud, camels differ from most true ruminants in that the adults retain two incisor teeth in the upper jaw. They also differ in the lack of an omasum, or third section, to their stomach. The smooth-walled rumen, or anterior section of the stomach, has diverticula (small sacs) opening out from it. The diverticula were formerly called “water sacs” because of a now-discarded theory (which appeared in Pliny’s Natural History) that the camel stores water in them. Actually, the fluid in these glandular sacs has the same salt content as the rest of the body, looks like green pea soup, and is quite repulsive. To the desert traveler without water, however, any fluid seems attractive, and it is quite possible that the many tales of people who have saved their lives by killing their camels to drink this fluid are true. Other internal differences of the camel include the absence of a gall bladder and the presence of oval red blood corpuscles, which are not found in other mammals.